Frequently designated as one of the best places to live in the UK, Solihull has some great attributes. With a population of over 200,000, our town is situated in the green belt and surrounded by countryside, so it brings the best of urban living and rural living together. The town is a mix of modern buildings and historic, with some shops and houses dating back to tudor times with their unique timber-framed construction. The name Solihull probably arose as a derivation of “soily hill” where the parish church of St Alphege was located, amidst sticky red mud during the winter. The shops in Solihull draw customers from miles around, including the modern Touchwood Centre which was opened in 2001. Touchwood houses over 80 stores, including a flagship John Lewis and a 9-screen Cineworld complex. For those who get peckish when shopping, the Centre also has over 20 restaurants and cafes, including the popular Wagamama and Pizza Express, so you’ll not go hungry! Solihull is also home to a very popular specialist museum – The National Motorcycle Museum, which houses the world’s largest collection of UK motorcycles. The museum has its own workshops to restore motorcycles and even sells the odd classic motorcycle on its website. Although not cheap, these vintage bikes are sought after and treasured as mementoes of a bygone age of motoring. The museum is easily found opposite the NEC and it’s well-worth booking one of their guided tours if you plan a visit. 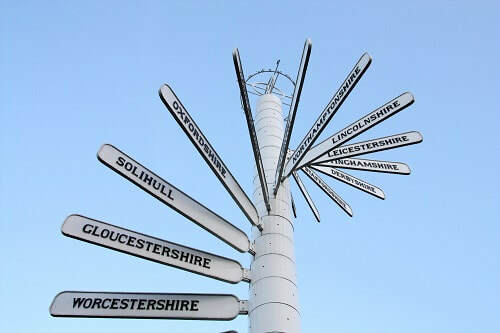 The NEC is also located in the borough of Solihull, in Marston Green, although it is usually referred to as Birmingham! Also known as the National Exhibition Centre, this vast venue is host to hundreds of exhibitions and events from Crufts to the Great British Shooting Show – and everything in between. Whether you’re looking for trade fairs in just about any industry or looking to buy gifts or luxury items, you can be sure there’ll be a specialist show or exhibition to cater for it. The NEC is the UK’s largest event venue and is ideally situated in the West Midlands, being close to Birmingham Airport and served by motorway links. But when you want to relax and get away from it all, you can chill out in one of the beautiful parks of Solihull – which total over 1,500 acres, so there’s no trouble finding somewhere for a quiet walk. Check out some of the famous people who have called Solihull home.